At Café Grumpy, Chelsea; by Sanam Erfani. It's been hot here, way more so than we're used to by this time of year. The local expression is, "Fair time, first frost" -- referring to the annual agricultural fair with all the trimmings, from midway to cow barns to quilt exhibits and tractor sales. The Caledonia County Fair was last week ... and we've been close to 60 degrees above frost. Dave and I took a couple of days to hunt down more mysteries, and I filled the last two weeks of August with house and yard projects and massive amounts of copyediting. It's good to be back in the blogging saddle again. The photo here probably looks a bit like Paris -- but it's in the NYC/Chelsea version of Café Grumpy, taken by my close friend Sanam Erfani in between her performances in Cats Don't Grin during the New York International Fringe Festival. The tender colors are another sign of summer's ending: all that brightness is softening at last. The kids are headed back to school. 4. Scheduled for tomorrow, Sept. 1: The newest Billy Boyle/World War II mystery from James Benn. It's a good one -- check in tomorrow for a full review. 5. Our top seller recently: signed copies of Lisa Brackmann's ROCK PAPER TIGER. For good reason. As an example of its value, here's a list of "kiwi" authors from the site. I'll be looking for a lot of these in the weeks ahead: Ben Sanders, Paul Thomas, Alix Bosco, James McNeish, Ken Benn, Neil Cross, Paul Cleave, Paddy Richardson, Trish McCormack, Vanda Symon, David Bates, Liam McIlvanney, Michael Green, Roy Vaughn, Maurice Gee, Lyn Loates, Yvonne E. Walus, Colin D. Peel, Andrew Grant, Dorothy Fowler, Lindy Kelly, Lee Wood. I also just learned that Dame Ngaio Marsh is part of the New Zealand mystery heritage. A tip of the hat and an around-the-world thank you to Craig Sisterson for crafting this blog, and to author Leighton Gage for pointing it out. Genre Boundaries, Not: Mysteries, Thriller, Suspense ... and "Romantic Suspense"
Summer's waning here in the mountains. The daytime temperatures still rise to about 80 on sunny afternoons, but as soon as the sun sets, we're in the 50s, with a few nights even chillier. We haven't yet pulled the down comforters back out, but sweatshirts for morning walks make sense. It's a season of change. So every now and then, I take time out and plunge into a book by an author I haven't yet explored. This week, Dave handed me a paperback copy of Elizabeth Lowell's 2006 THE WRONG HOSTAGE. Mystery? Suspense, as the front cover says? Within a couple of chapters, I was edgy and tense, telling Dave, "This is a thriller. Period." It's a question of pace, of risk, of threat. Plot pushes way past character. Dangers slice fast and sharp. To me, a thriller is the exact opposite of what Dennis Lehane creates in his dark, moody Boston detective novels (and he has a new one coming out later this season -- I've read it, it's good, and I have a lot more to say about it, but not yet). Lehane's character disturbances are so deep and compelling that he can hold the plot entirely on idle for months of the timeline, letting the paradoxes and pain soak in. In Gone Baby Gone, that's exactly what he does when the kidnapped four-year-old Amanda McCready is known to have died in a quarry, and Patrick Kenzie and Angela Gennaro agonize over what they could have done differently. Unbelievable though it is for the investigators, life does go on -- and so does the book. How does one define romantic-suspense? I think the best definition I ever heard comes from our own Elizabeth Lowell. 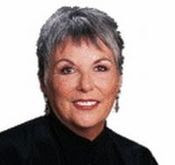 She once said that in a novel of romantic-suspense the relationship between the hero and heroine must move in lockstep with the development of the mystery/suspense plot. Every twist in the mystery should create a twist in the relationship and vice-versa. That said, I definitely did not find the "romance" track in THE WRONG HOSTAGE to be a distraction from the international thriller aspects of the book. David Morrell, novelist and co-editor of the recent anthology Thrillers: 100 Must Reads, defends such choices. "A lot of people see 'thriller' and think 'spy book,' " Morrell says. But a book like The Last of the Mohicans is "unquestionably a thriller — filled with chases and derring-do." Morrell also mentioned Dracula ("take away the supernatural elements and it's a serial-killer novel") and The Count of Monte Cristo. 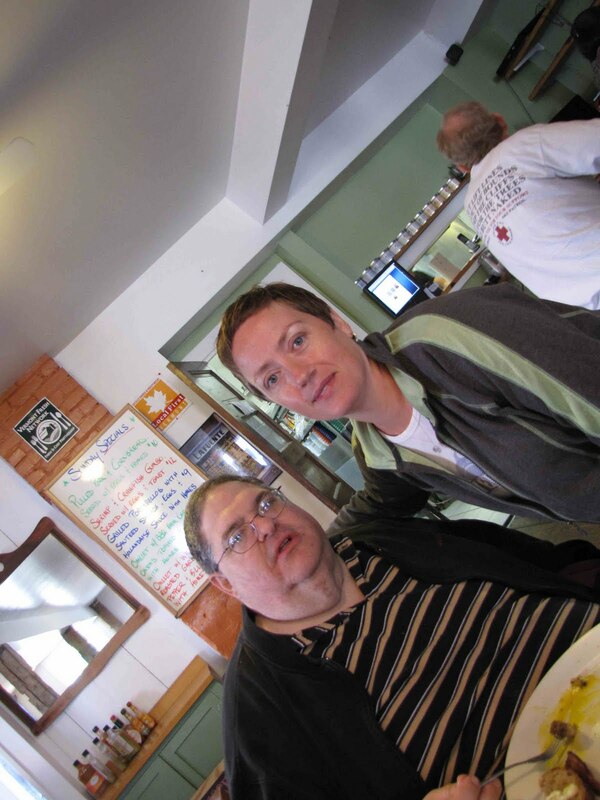 "As long as you have that breathlessness and sense of excitement," Morrell says, "then they're in." For the full list, and more discussion, check it out here. Earlier today, I found myself responding to an e-list in the mysteries field, where some authors were mentioning levels of pleasure but more often discomfort with their vision of enhanced e-books, giving as an example a Lord of the Rings reading experience that would include the film -- and effectively saying, "Let's read them first as text and see the bells and whistles afterward." I think we're going to see far more interesting "enhancements" than the equivalent of a DVD with a director's cut. First of all, though, I think it's very likely that readers will have choices on how much enhancement they want at any point in the reading process. You'll be able to click on "usual settings" that allow your reading device to deliver your preference -- which may be for just text, or text with illustrations, or text with soft jazz underneath, you name it. Color and speed will be variable. Font size, easily changed (oh blessings for us mid-lifers). Language (think of the possibilities for dual-language "facing pages" as we've known them in some books; think of being able to discuss texts with readers around the globe). Then I think there will be accepted levels and types of enhancement for different types of books. Children's picturebooks may have read-aloud settings that push children to sound things out or praise them for finding particular words or letters. Animal sounds, character voices, colors, you name it -- again, with some sort of controls for who gets how much, and when. Chapter books may have auto reward settings to encourage slow readers. For readers who tend to skim too quickly, there could be embedded responses needed -- if you can't say "why" Carla arrived at the house of the duck, you can't open the next chapter. Go back and re-read. I'll leave middle grades and YA novels to your imagination. Nonfiction will be entirely different, I think, with levels of footnoting, hyperlinking, and activity online all optional. Maps will be wonderful! So will bibliographies, which will become both clearer and more (optionally) extensive. And again, there will be options on language, global presence, commentary (think about the levels in religious texts, all controllable by the reader), and interaction with text, author, and reading communities. Art and culture will become part of ordinary learning, instead of being additions provided by clever teachers to bright students who finish the assignments early. Oh Brave New World, that has such readers in it! OK, the reason I just posted it here in full is this: I suddenly realized that Jasper Fforde's absurdly wonderful "crime fiction" series in an alternate reality where books can change, characters emerge to do mischief, plots warp into daily life -- has been prescient! That's what the enhanced e-book will FEEL like! We are in for a grand adventure, and I take particular delight in seeing that it's going to integrate global mysteries in fresh new ways, too. Hurrah!!! I always enjoy getting the e-previews of the New York Times book review section due to run each Sunday, released for e-reading a couple of days ahead of time. But when I noticed that Marilyn Stasio's Crime reviews would include Nevada Barr's new book, I resolutely left the e-mail unopened until this evening, after finishing reading the newest Ranger Anna Pigeon crime novel. BURN opens with Anna still on leave, recovering from the disasters of her ranger work at Isle Royale in Winter Study. Actually, her recovery was supposed to start in the number 15, Borderline, but as usual, given a situation in which she was supposed to act like an ordinary citizen on vacation, Anna ran into danger and took added risks and nearly died for the people she cared about. So here she is again, struggling with whether she can even be "just a person" instead of a ranger -- yet wondering also, as she explores New Orleans without her beloved new husband Paul, whether she'll ever get that significant job back again. Unquestionably, Anna was less crazy than she had been ... Coming off winter study on ISRO, Anna had been so crazy she had no idea how crazy she was. The intervening weeks had moved her a long way toward sanity. Now the black hole that had threatened to swallow her was a mere speck on her mental horizon. It would be great if Anna could act within the boundaries of that newfound sanity. Unfortunately, as the scorpion said when it stung to death the frog carrying it across the river, "It's my nature." And Anna's nature is to rush in and tackle the bad guys. Challenged by voodoo threats, pederasts, corrupt police, and smugglers of humans, she promises her husband Paul (by long-distance phone call) that she'll let him know if she's going to take any risks. But that's exactly what she can't seem to do. Nor can she "call for backup" (that call that so few TV investigators seem able to remember to make). Barr slams the opening chapters with horror after horror, taking just about everything that could go wrong in an urban landscape and throwing it at Anna. Realistically, this National Parks ranger is seriously screwed up from chasing, being chased, killing, and being gravely wounded over and over again. So as she dashes into the New Orleans desperation, her repeated poor judgment is all too believable. But does it make good reading? Or does it become what my mother would call "The Perils of Pauline" (an old-time serial in which the heroine is caught up in danger repeatedly)? Fans of the earlier Anna Pigeon books who enjoyed exploring the National Parks and their wildlife through the ranger's career won't find much here to recall those books; the scene is relentlessly urban, gritty, and dire. Nor does Anna seem to achieve insight into her actions. She may in fact rescue some of the people in danger as the book concludes -- but the cost is so high that her soul is shriveling. As Anna says, "Scars on the outside simply kept score; it was the scars on the inside one had to watch out for." Whether Barr can lead us from this web of scars into a 17th volume that's worth all this struggle becomes the pressing issue for her series. Oh yes, of course I enjoyed Stasio's review after I'd finished the book. Take a look, for a second point of view. And if you've read BURN, please do add your comments. And here's Nevada Barr's site, too, so you can look for her appearances and ask her some questions about this direction, yourself. A note in the New York Times book review section of August 15 reveals that Olen Steinhauer's terrific post-9/11 espionage trilogy is headed to Hollywood: George Clooney's production company has picked up rights to first of Steinhauer's trilogy, The Tourist. 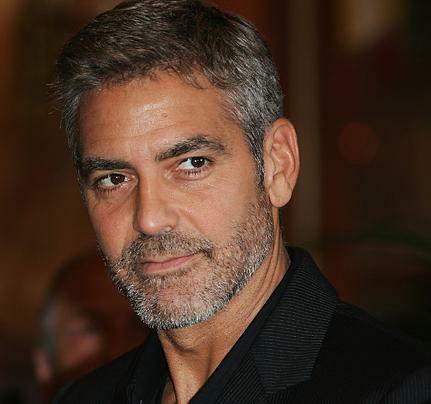 Clooney himself is scheduled to play agent Milo Weaver. Amazing! Here's the link to the full-length note. It's a companion to Steinhauer's review in the same issue of the newest Martin Cruz Smith (his 7th), Three Stations. Leighton Gage lives in Brazil. His fourth book in the Chief Inspector Mario Silva series, Every Bitter Thing, will be published by Soho Press in December 2010. In the post that follows, he tells us how his grandfather came to influence his writing – and his life. Welcome, Leighton! I have vivid memories of my maternal grandfather. He was a Yankee sea captain, descended from a long line of Yankee sea captains, who began his working life in the days of sail, ended it in the days of steam, and lived the kind of life the young men of today can only experience through books. He ran guns to Pancho Villa, smuggled whiskey and rum during prohibition, and was shipwrecked twice. He survived hurricanes in the Gulf of Mexico and Typhoons in the China Sea. Once, he was forced to kill a man. My grandmother, a Bermudian whom he met in Hamilton, married him at 17. He was 43. He claimed he’d never been married before, but my grandmother always had doubts about that. Together, they circumnavigated the world seven times. My mother’s earliest memories (she was raised aboard ship until she was four years old) were mixed with the straining of ropes, the creaking of masts and the slapping of sails. Many years later, my wife and I had a sailboat. We’d invite my Mom to spend nights on board. The sounds on that boat, reminiscent of those of her childhood, would always lure her quickly to sleep. Captain Leighton (Leighton was my mother’s maiden name - something else I owe to him) had an insatiable hunger for two things: travel and the written word. He passed both of them on to me. I came to recognize, only later, that Kipling’s words were a succinct summation of his philosophy of life. That’s what he believed, and that’s the way he lived. Another favorite writer was Joseph Conrad. He told me Conrad’s work was reminiscent of a conversation between one sea captain and another. Precisely true - because that’s what the writer and the reader both were. Grandad liked mystery authors a lot – and many of them later became favorites of mine. I don’t think it ever crossed his mind that I might become one myself. Certainly, he never tried to make it happen. But it did happen. And I don’t think it would have had it not been for him. Well over half a century has passed since my grandfather died. And now, approaching the magic age of seventy, I, too, am able to look back on a pretty adventurous life. I speak Dutch to my grandchildren, Portuguese to my wife, English to my daughters. I visited Spain in the time of Franco, Portugal in the time of Salazar, South Africa in the time of apartheid, Chile in the time of Pinochet, Argentina in the time of the junta, Prague, East Germany and Yugoslavia under the Communist yoke. I spent a year bicycling around Europe, another six years working in the Netherlands and Germany. During our three years in Australia I traveled extensively in Asia. I lived in Brazil during the time of the military government. Most of the time, I live there still. And, like granddad, I’ve managed to read a heck of a lot of books. My taste in reading is eclectic. I like both fiction and non-fiction, but when I pick up a mystery, I lean toward the ones that feed my taste for travel in space, or time, or both. The ancient Rome of Lindsey Davis, for example, or the modern Greece of Jeffrey Siger, or the nineteenth-century Vienna of J. Sydney Jones, or the Stalinist Russia of Tom Rob Smith. Among the most common advice given to authors is write what you like, write what you know. 1. I’m going to tell you a cracking good story. 2. You’ll learn a good deal about Brazil and its people. I’ll thank you for giving me a shot. As I thank Beth for past kindnesses, for the two feijoadas she cooked for us in her home, and for giving me an opportunity to meet with you here on her blog. We're tickled to note husband and wife Muller and Pronzini on the list, and we offer special congrats to Dave Zeltserman, a regular guest here at Kingdom Books. I'm taking some time out for more reading -- this week I've read a Charlaine Harris mystery and one of her Sookie Stackhouse novels (great fun, and not at all what I imagined! ), an advance copy of Dennis Lehane's next Boston mystery (omigosh, I can already visualize the film; I won't review this until closer to the release date, to spare you all the frustration of waiting too long), and am now enjoying a Janet Neel (my first). Also on my to-read list: Linda Fairstein's Lethal Legacy. You know the paragraph in the acknowledgments or dedication where the author mentions a spouse or child or parent, without whom, etc.? I can hardly wait for this Saturday, because hot from Brazil (well, cold might be more accurate, considering it's winter there) is a guest blog post from Leighton Gage detailing the effects on his writing of his grandfather. While you wait, take a look at his most recent post on "Murder Is Everywhere" -- yes, there is snow in those photos! Can you picture Angelina Jolie as Kay Scarpetta? While you work at being able to speak again, here's a link to the short Publishers Weekly announcement of the film plans and book sales. There was once a real road named "Faithful Place" within the network of neighborhoods that make up Dublin, Ireland. 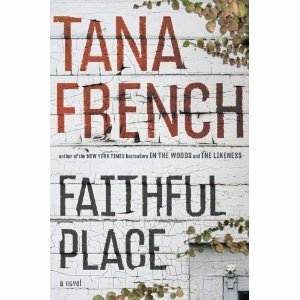 But the one Tana French creates in her third novel, FAITHFUL PLACE, is more real than that -- drenched in losses and laughter, sorrow and sometimes savagery. Undercover cop Frank Mackey walked away from it at age nineteen, believing that Rosie Daly, his girlfriend, had abandoned him. Or at least, if he didn't believe it, he believed he was alone and somehow deserved it. When Rosie's suitcase turns up 22 years later, the discovery drags Frank back to all the unfinished business he'd hoped to avoid. Some of it is in other people; some of it is in him. His ex-wife Olivia, it turns out, knows more about that condition than Frank ever realized. They knew it by heart, just like every family that's lost a child -- I once had a mother show me which glass her son drank out of, the morning before he took his overdose. A Sunday morning in Advent, cold, with a gray-white sky and breath hanging in the air like fog. Rosie had come in early the night before, so she had gone to nine o'clock Mass with the rest of the family, rather than sleeping in and getting the noon Mass, the way she did if she'd been out late Saturday night. They had come home and made a fry-up for breakfast -- back then, eating before Holy Communion earned you a string of Hail Marys at your next confession. Rosie had done the ironing while her mother washed up, and the two of them had discussed when to buy the ham for Christmas dinner; it grabbed my breath for a second, the through of her calmly talking about a meal she had no plans to eat and dreaming about a Christmas that would be just hers and mine. That fragile bubble of hope for a life outside of poverty and brutality had burst for Frank, shattered without Rosie. He'd left home anyway, crafted a life for himself, a set of rules and community within which he had some faith, some trust -- things that the neighborhood of Faithful Place so sorely lacked. Or did it? What could be relied on? Where was the truth? Who, besides his daughter, who didn't know better, would be faithful to Frank Mackey? French's langorous scenes, richly detailed and painted with longing and tenderness even in the midst of assault and cussing, are stabbed fiercely with the suspense and tightly knotted strings that Frank must untie. The sanctity of memory and love sort out repeatedly in twists of plot and layers of character. What are the sins of commission and omission? Who pays the price? Every wrench of the heart in this intense and vivid novel comes with both a gasp of surprise and a sigh of "ah, I knew that had to come sooner or later." Frank's ultimate payment, his ultimate revelation, is soul-shattering. Yet Faithful Place and its bonds of family may yet have something that's worth his return. At what cost? I'll be re-reading this one, and finding copies of French's earlier volumes, In the Woods and The Likeness. They are linked to this third one through the Dublin Murder Squad, but not directly in terms of characters. So -- FAITHFUL PLACE stands alone, taking in a trembling breath and facing both the past the the pain of the present. It's a grand book, and a wonderful read. The cool nights of August have arrived, and I've seen a few tree branches parading festive colors. Autumn's on its way. Given the 2,800-year tradition of Greek poetry, it’s no surprise that it took four foremost contemporary translator-editors to thoroughly survey it. Nor does it surprise that the twentieth-century section is only 30 pages shorter than that encompassing the classical period, 800 BCE–200 CE; Greece’s modern literary renaissance, affirmed by Nobel Prizes and other international awards, is an ongoing miracle. And no one should blink over the same characters and stories being cited by some of the oldest and some of the newest poems in the book; those specifics are genuinely timeless. What is surprising is how many well-reputed translators have been drawn upon, including such otherwise eminent poets as Anne Carson, Olga Broumas, Fleur Adcock, Seamus Heaney, C. K. Williams, Paul Muldoon, William Matthews, Carl Phillips, Sherod Santos, and Brendan Kennelly among the quick and James Merrill, Ezra Pound, Kenneth Rexroth, and Rudyard Kipling among the honored dead. Congrats, Rachel -- keep reminding us of the breadth and depth and glory of poetry's heritage. 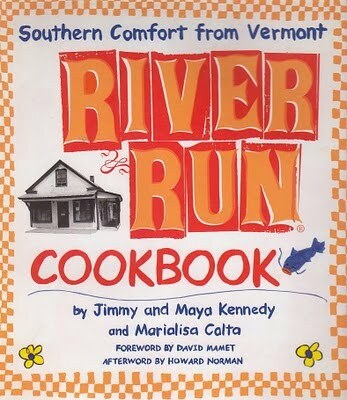 The restaurant's cookbook was co-authored by its founders, Jimmy and Maya Kennedy, with famed food writer Marialisa Calta -- but it also included pieces by authors Howard Norman and David Mamet. We've met there with poets Ron Padgett and Bill Corbett; author Leda Schubert; artist and illustrator Mary Azarian; bookstore owners; and in general, creative, wonderful people within an hour's drive of Plainfield, Vermont, where the restaurant has stood since 1991 (two sequential buildings, though). Even more important, the River Run was home to friends and families, holding the community safe and snug (even when the winter wind blew around the loose windows). You could count on breakfasts fit for a working person: oatmeal, pancakes, French toast in thick slabs, grits, gumbo, granola, even pulled pork. 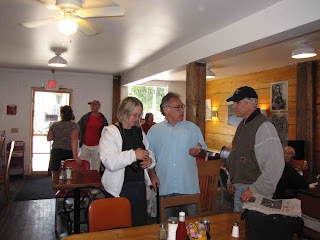 A long transition into the hands of new owners (Spanish cuisine) meant that today would be the last River Run breakfast. We were there -- we got up at 6 to avoid a long waiting line (that's painful when you go to sleep at 1 a.m. but it was worth it). In the photos: Howard Norman with friends (by a newly cleared table -- the place was packed even though you don't see the crowd here), Jimmy in the kitchen, Dave with former food server Nessa Rabin. Hard to believe it's over. 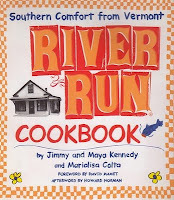 PS: We just found a signed copy of the River Run Cookbook -- it's online for sale, here. 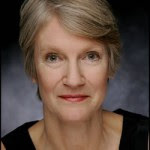 There's a short note about Dolores Gordon-Smith's fourth book, A Hundred Thousand Dragons, at the Killer Books web site this month (provided by the Independent Mystery Booksellers Association). And our review of this delightful British historical mystery, in the footsteps of Lord Peter Wimsey (and also, in this particular case, with a touch of Elizabeth Peterson), is here. And now, the author joins us to share her pathway into research for the book. Welcome, Dolores! “How on earth,” said my sister Barbara, after reading A Hundred Thousand Dragons “do you know all this stuff?” I could see her point of view. A Hundred Thousand Dragons starts off in the London of the 1920’s, moves to Sussex, has a flashback to the war in Arabia in 1915 (with a visit to Petra thrown in) and ends up in a lost Nabatean city in the 20’s. Along the way there’s various cars, aeroplanes, clothes – oh, and a coded message that has to be worked out too. And Barbara’s my older sister and knows – because of the chronological accident of not having been born until way after the 20’s – that I can’t remember any of it. Hmm. The quick answer is, of course, “research” but that has to be unpicked before it’s any use. The reassuring thing, to anyone thinking about writing a historical, or, indeed, any sort of book (because all books have “stuff” in them) is that you don’t do it all at once. I’d mentioned Jack’s war in the three previous books but wanted to make it more central to this story. Where’s an exciting place to fly? Arabia? Oh yes, because I’m also interested in archaeology and that ties in. You can see links forming, can’t you? And you can’t think of Arabian archaeology without thinking of Petra, the granddaddy of all “lost cities”. 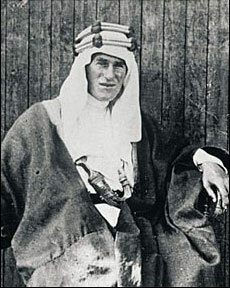 At this point I read TE Lawrence’s (“Lawrence of Arabia”) Seven Pillars of Wisdom. I read lots, but perhaps the most useful book was by the journalist Lowell Thomas, With Lawrence In Arabia. Thomas, a contemporary of Lawrence, has brilliant descriptions of the desert war and – bingo! – Petra. With the main planks of the story in place, I started to fill in the details. Cars are important in the story. I like old cars anyway, and a trip to the Beaulieu Car Museum and their fantastic library paid rich dividends. When Jack is investigating the burnt-out Rolls-Royce he asks who, in the neighbourhood, owned a Rolls. In the list of names is a “Major Warren of Handcross”. He’s a real person, culled from Beaulieu’s records. I couldn’t resist putting him in! Shipping times from London to the East were the result of an afternoon spent poring over microfilms of old newspapers in Manchester library and Jack’s researches more or less mirror my frustrations. And codes? Well, I didn’t know I was interested in codes before I started, but I soon got interested in codes. But, perhaps, one of my favourite pieces of research was morning coffee in the Savoy and afternoon tea in Claridges Hotel. I know, I know. Research is tough at times! This "debut" mystery from Delia Rosen will fit into many collections: cozies featuring smart women (Gwen, née Katz, Murray is adapting to the move from New York), cozies involving food (it's set in the Jewish deli left to Gwen by her uncle Murray), mysteries set in Nashville (yep, it's the only Jewish deli in town), and of course, mysteries with Jewish themes and recipes! That's right, the book wraps up with Murray's Cholent (a smoky Southern version, cooked in a crockpot), Newt's Chicken Okra Soup, and three more yummy possibilities. Thank goodness -- because in the opening chapter, Gwen is desperately confronting a roast pig that's shown up in the kitchen, a staff crisis, and -- by the end of the chapter -- a dead customer, the literal kiss of death to a restaurant's business. And it's not clear whether her New York style of management is going to make it in the heart of the South, without any friends from the old life. Of course, Gwen does have the plus that she's been a forensic accountant, and by the state of Uncle Murray's accounts, she'll be putting her math talents to work, if she ever has time to do so. 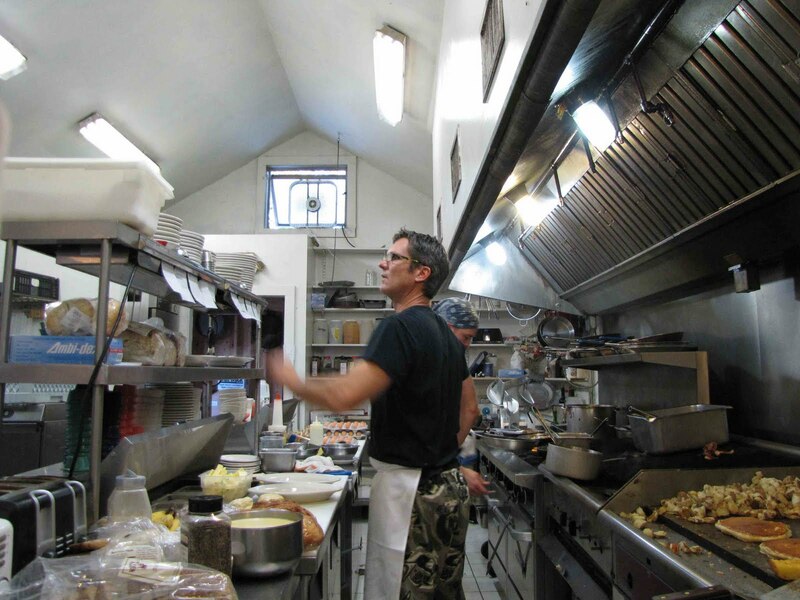 This is a lively, smoothly written, and often very funny cozy, where deaths and threats can be dwarfed by the crisis in the kitchen or in the downtown's politics. It doesn't taste at all like a debut mystery. Turns out that while it's a debut for the Delia Rosen pen name, it's far from a first book for Jerome and Suzanne Preisler, who recently collaborated on three books in the "Grime Solvers" series. And Suzanne Preisler has extensive restaurant and floral experience with which to salt the novels. You won't be able to pick this up until October (the official release date is Oct. 5, and it's a paperback original, no hardcover), but it's a good one to put onto your "wish list." There will clearly be more from Murray's Deli and Gwen -- and I sure hope she figures out how to find some nice Jewish boys in Nashville! For Whom, My Word, For Whom? Publishing a “Selected Poems” is my major accomplishment of the year, after a span of 36 years, during which I managed to get three smaller collections into print. But who is the audience? For whom were these poems, some as old as forty-five years, written? What reader wants to be jolted from poem to poem without an overall theme or plot, a two-line practical joke of a political poem followed by a two-pager in a completely different voice? How does one approach a mishmash of more than one hundred poems, all written by a single author? I was not especially aggressive in seeking publication; I entered the manuscript in a couple of pay-a-reader’s-fee competitions, and received a personal rejection slip from a friend of a friend at one of the best-known small presses. All the while I was tinkering with the manuscript, mostly thinning and adding new poems. My most recent submission of the manuscript had languished almost a year in the hopeful pile at another small press when along came an email announcement from Mayapple of its annual submission deadline. I was on it like yellow on a banana. In June, advance copies of my book arrived while I was in my first week of a two-week residency in Castleton with 120 teenage artists and a staff of twenty-five working artists. It was an important moment in my life as a writer; that night I modestly alluded to it in the annual faculty performance where each teaching artist has ten minutes to strut or discuss recent creations. I swallowed the urge to sell the book, a rare sensitivity to the nature of young minds and a captive audience. Meanwhile, I’d been adding email addresses from my inbox like crazy since May. Unaware of Internet ethics, I copied and pasted to my contact list anyone shown as a co-recipient of several group emails and announcements that I hadn’t deleted. Included were my fellow staff members at the teenage arts institute, college acquaintances I hadn’t seen since graduation, numerous colleagues from my former job, etc. Soon as the institute adjourned and I was back on home turf where I could efficiently fulfill orders for the book, I pressed the “send” button on my announcement and braced for the response. Were these the people for whom I’d written these poems? Would the publisher find a broader audience? How does one sell a life’s work? To whom? And why? And what comes of it? In my case, silence is a sad anticlimax. I want the plus signs and the minus ones! At the same time, I realize that almost all these poems were written without a specific audience in mind. If I wrote them for anyone, I guess you might say I wrote them for myself. Sure, [Yu Jian] will be reading at the next resident reading on Tuesday, August 17th with his translator, Wang Ping. They will read for about 20 minutes out of a total reading time of an hour. Resident Readings take place at VSC's Lowe Lecture Hall on Main Street starting at 8 pm. On Friday September 17th, 2010, Vermont Studio Center and the Association of Literary Scholars, Critics, and Writers (ALSCW) will co-sponsor the first annual Literature in Translation forum. Polish poet Adam Zagajewski (who will be at VSC for the week as a Visiting Writer) and his translator, Clare Cavanagh, will lead an evening in the Lowe Lecture Hall about the art of translation, not only as it relates to literature but to creative work more broadly across genres, media, and cultures. The evening is open to the public and will feature a talk, a joint bi-lingual reading, and a question and answer session. Also in residence in September will be Mexican poet Jeannette Lozano and her translator, Curtis Bauer. In October 2011, the Italian poet Patricia Cavalli and her translator, Geoffrey Brock, will be featured in the 2nd of these annual public forums. It's a great way to savor the best of the summer evenings, as autumn creeps close. 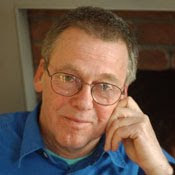 Reminder: Check in tomorrow for our guest blog post from Vermont poet Geof Hewitt, author of the 2010 collection A Perfect Heart. This summer's Resident Poet at The Frost Place (Robert Frost's home in Franconia, NH, at the time when he finally broke into American publishing), Adam Halbur, gave a great reading at the St. Johnsbury Athenaeum this evening, with Ron Padgett taking the other half of the program. What a great evening! Halbur shared new work from his residency, and Padgett provided poems from his spring 2011 collection. With their Midwestern roots, the two poets, young and older, framed language in fresh but very accessible ways. In July and August, The Frost Place hosts a poet-in-residence who lives and writes in Frost's farmhouse, offering three public readings during the summer. The Trustees of The Frost Place have awarded the 2010 Resident Poet fellowship to Adam Halbur. Adam Halbur was born in 1976 and grew up feeding rabbits, chickens, pigs and steers and milking goats in the rural Midwest. He is the product of German farming immigrants that stretch back five generations from Wisconsin to Nebraska to Iowa and of newer arrivals from Denmark, Lithuania, Bohemia, and French Canada who included a painter, a single mother, a doctor, and probably a carpenter. Much of Halbur's first collection of poems draws on this history as well as on his time as a small-town newspaper reporter. From the age of thirteen, he went away to school and was largely influenced by friars, monks and nuns, receiving his secondary education at Saint Lawrence Seminary, Wis., and his post-secondary at Saint John's University and the College of Saint Benedict, Minn. He earned a B.A. in English literature with studies in poetry in 1998 and completed his M.F.A. in 2003 at the Warren Wilson Program for Writers, N.C. Though he has held various jobs as a factory worker, park attendant, home insurance audit reviewer and writer and editor, he has taught English as a second language at Japanese and American universities since 2007 to people of various origins, including Japan, Nepal, Saudi Arabia, China, Vietnam, Germany, and Mexico. He is currently an associate lecturer at the ESL Institute at the University of Wisconsin, La Crosse, but with his wife, son and daughter, continues to split his time between their two home countries of the U.S. and Japan. Halbur published his first book of poems, Poor Manners, in July 2009 in Tokyo with Ahadada Books, the small press of Maryland native and poet Jesse Glass, a professor at Meikai University. 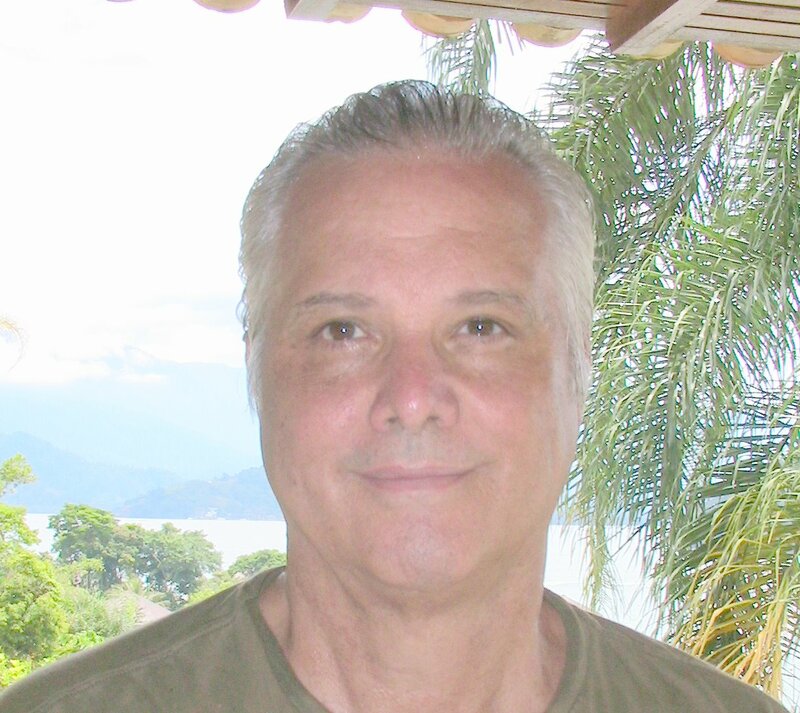 His work has also appeared in the anthology Never Before: Poems about First Experiences (Four Way Books, 2005) and in magazines such as The Fourth River, Fauquier Poetry Journal, and Dunes Review. 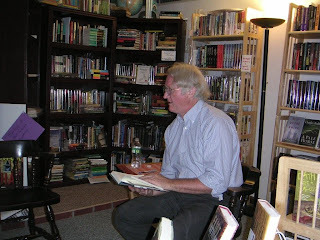 Last night's visit here by Eliot Pattison focused on his colonial American "Bone Rattler" series, but he is probably better known as the author of the Inspector Shan (pronounced "sh-ah-n") series, set in Chinese-occupied Tibet and occasionally in Beijing. Pattison gave a cover blurb to Lisa Brackmann for her current best-seller, Rock Paper Tiger, which he enjoyed very much. Pattison's "justice fiction" deals almost entirely with mid-life adults and older ones, seekers and teachers. Brackmann's is set in the gaming world of younger adults. And I've been thinking about other mysteries that connect with China. Also on our shelves here, of course, are the mysteries by Qiu Xiaolong, starting with A Loyal Character Dancer, which features teamwork between Inspector Chen Cao of the Shanghai Police Bureau and Inspector Catherin Rohn of the U.S. Marshals, trying to solve a missing persons case. 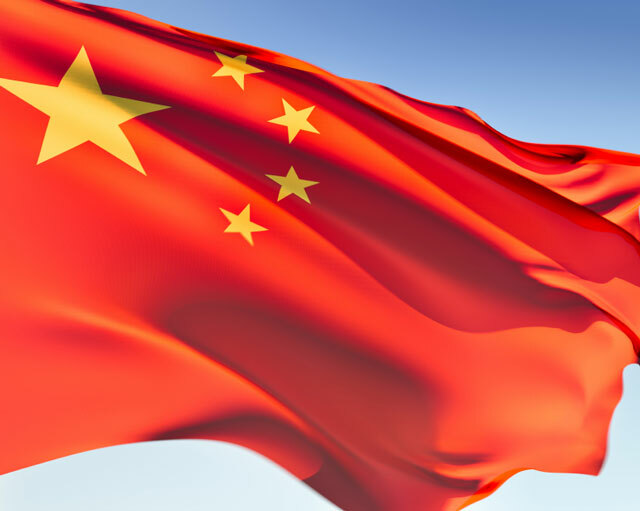 This one gives good insight into modern urban life in China, as well as peering into the relationship of the triads and the Chinese government. That takes me to the Lydia Chin mysteries by S. J. Rozan -- who is not Chinese herself but clearly knows the Chinatown world, as well as investigative process. Her most recent, The Shanghai Moon, delighted me with its twists and finale. And for one more very different direction, there's Deep Creek by Dana Hand -- probing the anti-Chinese sentiments of America in 1887, through the struggles of Idaho lawman Joe Vincent to solve the murder of more than thirty Chinese workers. Vincent's connections with Chinese investigator Lee Loi and mountain guide Grace Sundown yield a page-turner with an intensity that can be surprising in what appears at first glance to be a historical novel, but turns out to be an artfully crafted crime and justice narrative. As some of us were saying last night, mysteries set in other landscapes give us a swift way to grasp not just the differences of land and language, but also the otherwise indescribable differences in global culture. For a land as large and varied as China, I'm looking forward to reading more of these books with continued variety. If I never get there in person, at least I'll have an updated and deepened sense of what I'm missing. Dave and I assure each other almost daily that shaping Kingdom Books as a specialty shop -- thousands of mysteries on the shelves all around it, and in the other room, a couple of extra cases of those other books we can't pass up, like some fine press work and the poetry that I'm hooked on -- was the best decision we ever made. We love what we do, and focusing on mysteries keeps us excited and always learning. But I've got to admit the guest posts I've lined up for the next couple of weeks speak to our wider interests! First there's a dandy piece from Vermont poet and slam poetry pro Geof Hewitt, whose new book The Perfect Heart is such a pleasure; then we'll welcome New Hampshire novelist Katie Towler, whose third and final volume set on Snow Island just came out, Island Light; and then, back to mysteries at last, as we've asked a couple of authors with new work scheduled for this fall to step up. Calling Elliot Pattison's work "crime novels" mis-labels what he's doing -- because they're actually "justice novels." 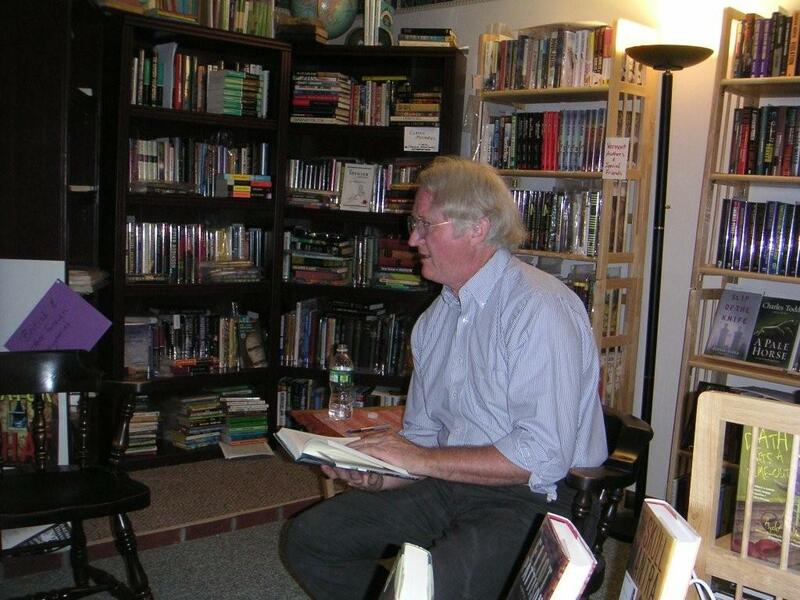 As he spoke at Kingdom Books this evening, he drew parallels not just between the protagonists in his Bone Rattler series -- exiled Scotsman Duncan McCallum and Native American (Nipmuc) shaman Conawago -- but also between McCallum and Inspector Shan, another outsider, caught up in the ongoing injustice of the Chinese occupation of Tibet. After reading three sections from his newest book, Eye of the Raven, Pattison also mentioned the coincidence of connecting after its predecessor, Bone Rattler, with a reader whose heritage is Iroquois; shared his passion for international concern about Tibet; and promised at least one more book in the Bone Rattler sequence and two more with Inspector Shan. But in early 2011, he said, he'll interrupt both of these sequences with a fresh one, running in parallel in terms of people isolated by the events around them. We'll all have to wait a few more months before the publisher of this new book, Counterpoint, will let us know what's up. It was a terrific evening, with interested readers, compelling discussion, and many after-event conversations. Our thanks to Elliot Pattison, who shared a portion of his short vacation time here, before returning to his writing and his legal career. Here's to more of his thoughtful and tightly plotted books.